The ultimate medium to super-telephoto zoom lens. If you’re looking for a compact, versatile telephoto zoom lens that handles portraiture as well as it handles long-distance wildlife and action photography, look no further than the AF VR Zoom-NIKKOR 80-400mm f/4.5-5.6D ED. With the broadest focal length range in our super-telephoto zoom lineup, it reduces the number of lenses you need to carry into the field and expands your handheld shooting capabilities, thanks to Nikon’s Vibration Reduction (VR) technology. Create spectacular photos and HD videos, in any light, from any distance. Travel light. Shoot with confidence. 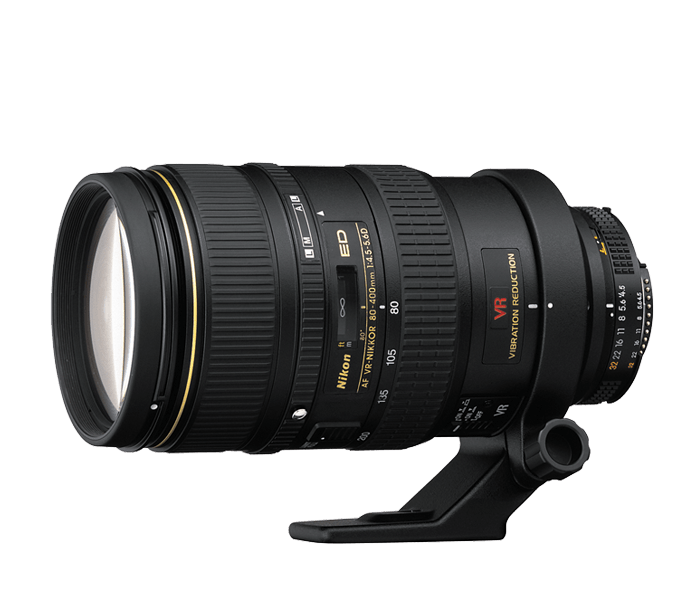 The AF VR Zoom-NIKKOR 80-400mm f/4.5-5.6D ED covers the broadest focal length range of any NIKKOR super-telephoto zoom lens. At 80mm, its an ideal medium-telephoto portrait lens. At 400mm, its a powerful super-telephoto lens suited to wildlife and action photography. Slow down your shutter speed and capture brilliant shots in low-light situations—Nikon’s VR image stabilization will keep your photos and HD videos razor-sharp. Nikon VR (Vibration Reduction) image stabilization provides 2.0 stops* of blur free handheld shooting, assuring dramatically sharper still images and HD video capture. This opens a new range of handheld and low-light shooting opportunities. When you’re using a tripod, the VR system delivers a specialized correction to reduce the camera shake caused by the shutter release. *Based on CIPA Standard. This value is achieved when: FX-format compatible lenses are attached to an FX-format digital SLR camera and zoom lenses are set at the maximum telephoto position.